The Three Brothers and a Violin had no problem in finding a name for themselves. But the problem came when the three of them sat down to plan their first album. 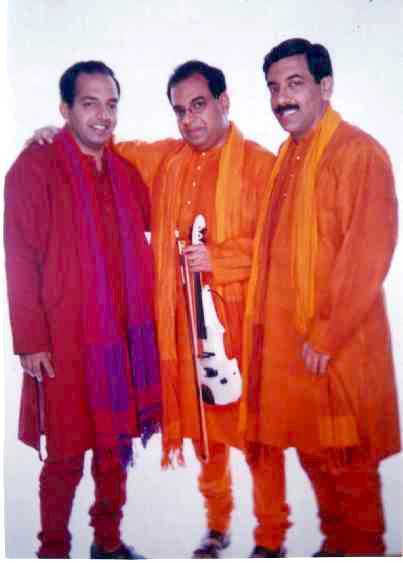 It took the three Parsuram brothers---Sriram, Narayan and Viswanath and their white midi zeta violin---months to decide the language and the genre of music to select for their debut album. A year later, they brought out their debut album Savariya (Once Upon A Time) that rocked the Indipop world. The album introduced an altogether new sound to the Indian pop listener with its extensive use of harmonies and Sriram's violin. The music veers towards fusion and has almost a classical base. The three brothers feel that Indipop is still in its evolving stages and through Savariya, they have attempted to elevate the Indipop genre to a high where it rightfully belongs. Says Sriram, "The album seeks to define its own idiom. It springs from our understanding of classical music. The compositions and the singing seek to blend the fresh with the familiar, Indian and International, traditional and the contemporary." Already a hit with serious music lovers, the album seeks to stimulate the mind and the heart. " We hope that our music will appeal to the classes as well as the masses. Such innovation comes from a deep understanding and respect for traditional music," says Narayan. The theme is nostalgia and romance. Though the brothers say that all the songs will find their own listeners and fans, they unanimously picked Savariya as their lead song because it evokes sweet memories. The song is a blend of harmonies and the lyrics move smoothly between Hindi and English. Sapna Re was their second contender for the top pick with its catchy and brisk composition. Udi Chali [She swept me off my feet] is sheer listening pleasure due to its powerful beat and a breathtaking violin passage. But the brothers' favourite song is Mat Jaa, composed as a tribute to Mother Teresa. Drawing from a traditional bhajan, this song has English lyrics, which blend superbly with a neo- fusion composition. The album already has three big Bollywood fans in Anu Malik, Pyarelal and Anand Raj Anand raving about it. Despite their first album the three brothers are not new to the music scene. They have been performing as classical musicians for almost 25 years and have given over 1,000 public performances all over India and also in the US. Viswanath Parsuram, the eldest of the brothers, is a vocalist and a classical mridangam percussionist. The English lyrics for the title track Savariya have been penned by his wife, Shoba. Sriram, the middle sibling, is a vocalist and a violinist and one of India's very few musicians trained in Carnatic, Hindustani and Western classical music. Among the cognoscenti he is regarded as one of India's best violinists. An engineer from VJTI, and also a management graduate from IIM, Calcutta, Sriram also has a Masters in violin from Akron University, USA and is now completing his doctorate in Ethnomusicology or World Music from Wesleyan University, USA. Narayan, the youngest and the most colourful of the lot, is a vocalist and plays the ghatam. An engineer from IIT, Mumbai, Narayan did his Masters from Clemson University, USA. He has also done a diploma in sound engineering from the Audio Institute of America, California. With such credentials it comes as no surprise that the album was a hit with both classical and pop music enthusiasts. But more than the album it was the video of the title song which became a favourite of all music channels. One of India's best computer graphic technicians, Pankaj Parashar directed it, thus making Savarya not just a listening but also a viewing pleasure.